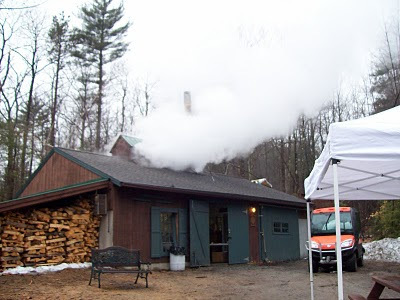 NH Maple Season: It's Steaming! The month of March in New Hampshire is typically gray, blustery, and boring -- especially when it comes to outdoor activities. The one bright spot for me is maple sugar season. Last year Doug and I visited a sugar shack for the first time and I thought it was pretty cool (Read The Maple Guys and Ice Out). In this post, I'm highlighting some of the maple events taking place in our state in the next few weeks. If you want in on the action, my advice is to start planning now! Maple Weekend -- Over 65 sugar houses across the state will welcome visitors on March 27th and 28th (sponsored by the New Hampshire Maple Producers Association). Check out their website for a list of sugar houses by county and a description of events at each location. You can enjoy hot dogs boiled in sap; feed goats and chickens; take a horse-drawn ride and of course, collect sap and watch the whole syrup making process, weather permitting. Remember that sap doesn't flow until temperature conditions are just right. You can read the basics of maple syrup production in New Hampshire here. March Maple Madness -- This is an Inn-to-Inn event in Mount Washington Valley "held together by maple syrup and wacky fun," according to the sponsors. Basically, you take a self-guided inn-to-inn tour, sample some sweet maple treats all the way and earn points for select activities. There's a scavenger hunt and a "Hare Raising Quiz," along with a chance to visit several sugaring locations to see the maple syrup process firsthand. Tickets are $15 per person and are valid for both days: March 27th & 28th from 11:00 am to 4:00 pm. NH Maple Festival -- This two day event (same weekend) takes place in the Woodstock area and is about as serious as you can get with maple sugar fun. Let's see...there's an opportunity to "bring in the sap," enjoy a maple dinner, and watch the Maple Sugar Parade. This year's parade features the crowning of the first-ever Maple King and Queen and the ever-popular bed race. There's more to this Festival, too. You can take part in a sap-collecting obstacle course on snowshoes (is there enough snow in Woodstock still?) I'm not sure how the sap collecting works, but someone rings a cowbell and the contestants are off! According to the website, you'll need to collect at least two quarts of sap to be a serious contender. Maple Sugar Madness! Last but not least, this is hands-on maple sugaring at its best. Each weekend during March, Prescott Farm Education Center in Laconia NH offers the chance to do it all yourself -- from tapping a tree to boiling and finally, tasting the sweet syrup. You need to reserve a spot in advance, either online or by calling 603-366-5695. If you know of any other maple sugar events in the state (and I'm sure there are many more! ), please drop us a line. Before we leave Old Man Winter behind, I'm happy to share another guest post from Patrice (see her great blog at Life Less Ordinary.) Patrice and her partner in crime (a.k.a. her husband Justin -- that's him shown on skis) were lucky enough this year to check out the Annual Chocolate Festival in Intervale, NH. We're lucky that she decided to share it all with us here. Enjoy! The Annual Chocolate Festival combines two great loves: chocolate and skiing/snowshoeing. From 11 a.m. to 4: 00 p.m., Intervale's 65km of trails are open with special pitstops for participants. This year, there were nine "official" locations where you could receive stamps and a special chocolate treat. Stops included the Ragged Mountain Equipment, 1785 Inn, Adventure Suites and Whitaker Meeting House. The treats ranged from chocolate cupcakes to fondue to brownie sundaes to chocolate wine and beer. Aside from the nine stops, some local businesses also offered discounts and deals. Tickets are cheaper when purchased in advance ($20 vs. $25). You don't necessarily have to ski or snowshoe, but that might make you feel less guilty about all the chocolate treats! They advertise a shuttle running between stops, but I never spotted it. You could even walk or drive around town to each stop; I saw a lot of people doing that. If you go to all nine stops and get all your stamps, you're entered into a grand prize raffle. I've never skied Intervale's cross-country trails before, but they definitely seemed used and abused for this event. Some of the trails were even closed for lack of snow. It could have a lot to do with the fact that there were 100s of people hitting the trails and Mother Nature hasn't sent us much snow this winter. In any case, if you participate next year, I would say don't expect stellar skiing. I was on cross-country skis and I almost wish I had snowshoes instead. There were a few sections where we had to go ski-less because it was too muddy. On the flip side, you go slower when snowshoeing. The Mt. Washington Valley Ski Touring and Snowshoe Foundation puts on the annual fundraiser which always occurs on the last Sunday in February, so mark your calendars for next year. I don't know if I'll go again, but I'm glad I finally marked it off my list! Note from Lucie: For those planning to attend next year: Be sure to check the event website for trail conditions in advance. As an aside, we haven't been able to get outdoors much this winter for lots of reasons. Let's just say we're thinking spring! 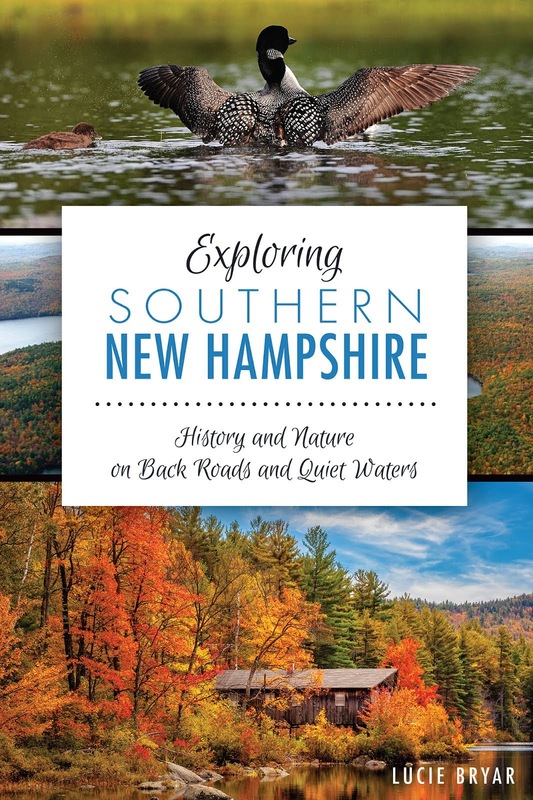 If you're out and about exploring New Hampshire, why not send in a guest post? You can contact me through the comments section or at nhloveitorleafit@gmail.com.